It looks like their long-standing beef is officially over. 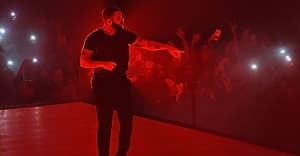 Drake's Aubrey and the Three Amigos tour stop in Boston on Sunday came with a surprise guest nobody expected when he brought Meek Mill out on stage at the TD Garden. The Philly rapper joined Drake on stage to perform his 2012 track "Dreams & Nightmares", with Drizzy serving as a temporary high-energy hype man. Thumbnail image via Kevin Winter, Rick Diamond for Getty Images.